Falc-O-Tex and Falc-O-Stick release tape is used for the protection of heat-sealing wires and jaws in Shrinkwrapping operations and non-stick form fill sealing. Packaging foils are welded by applying heat and pressure. 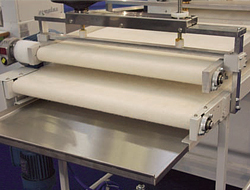 L-Sealers are generally used together with a shrink-tunnel.